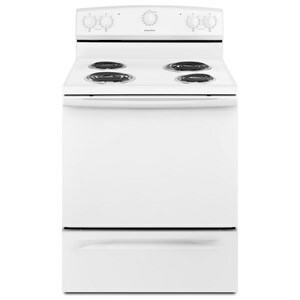 Cooking is simple with this 4.8 cu. ft. electric range. The smooth ceramic-glass surface is sharp and sleek and makes cleaning a breeze. No more will you have to worry about spills and crumbs falling into the heating elements because of the flat, radiant heating elements. Thanks to the Spillsaver™ ceramic cooktop edge, spills and crumbs will stay off the floor as well. Two 6" 1200-watt burners, one 8" 1800-watt burner and one dual heating element (9"/6" 3000/1400 watt) make the cooktop, giving you various options for cooking your food. After dinner, once the dishes are clean, store them in the convenient storage drawer below the oven. The Electric Range 4.8 CU. FT. Electric Range with Spillsaver™ Ceramic-Glass Upswept Cooktop by Amana at Pedigo Furniture in the Livingston, Onalaska, Trinity, Coldspring, Corrigan, Huntsville, TX area. Product availability may vary. Contact us for the most current availability on this product. SPILLSAVER™ CERAMIC GLASS COOKTOP: Spills and splashes are a cinch to clean up thanks to the upswept design of this smooth cooktop. Plus, the sleek design adds a premium accent any kitchen. 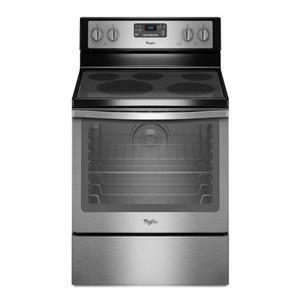 OVEN CAPACITY: The large oven capacity of this range lets you cook multiple dishes at once, so you can handle everything from daily meals to large family dinners with ease. EASY TOUCH ELECTRONIC CONTROLS: Set bake or broil temperatures with just a touch. Plus, a clock and oven timer make it easy to count down to dinner time. Control lockout prevents unintended use as well. ADJUSTABLE TIME SELF-CLEANING OVEN: Let the oven do the dirty work. This adjustable time self-cleaning oven lets you select the right amount of time for light, medium or heavy soils.